The Ichimoku Kinko Hyo, also known as the Ichimoku Cloud, is a versatile indicator that defines support / resistance, trend direction, momentum and trade signals. The indicator was developed by Goichi Hosoda and you may compare the Premium features with the library version here. You may register for FREE trial anytime. 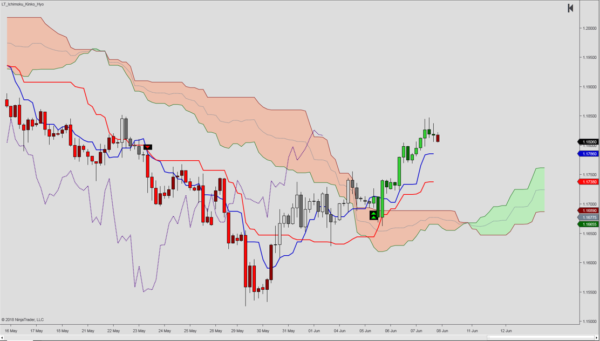 The most characteristic feature of the Ichimoku indicator is the cloud (Kumo). It is comprised of two lines, the Senkou Span A (green) and the Senkou Span B (red). A trend can be found by determining whether prices are trading above or below the the cloud. If prices are trading within the cloud, it indicates a sideways market. Furthermore, an uptrend is considered strong if the Senkou Span A (green line) has crossed above the Senkou Span B (red line), plotting a green cloud. A strong downtrend has a falling Senkou Span A (green line), crossing below the Senkou Span B (red line) and plotting a red cloud. Because the cloud is displaced 26 bars forwards, it can also provide a forecast of future support / resistance. The Tenkan-sen (blue) and the Kijun-sen (red) lines are used to identify faster and more frequent market moves. The Tenkan-sen is calculated using a 9-period high adding a 9-period low and dividing by two (9-period high + 9-period low)/2)). The Kijun-sen applies the same formula on a 26 period (26-period high + 26-period low)/2)). The relationship between the two is similar to that of a 9 and 26 period moving average. The 9-perid is faster and follows the price plot relatively closely whereas the 26-period is slower. The 9 and 26 are the same periods used to calculate MACD. The classic signal is to wait for the Tenkan-sen to cross the Kijun-sen. However, although effective, the signal will occur infrequently in strong trends. Therefore, additional signals may be located when price crosses the Tenkan-sen, alternatively the Kijun-sen. The most favorable setups are aligned with the cloud and the major trend (above green cloud = bullish / below red cloud = bearish). The cloud can also be used as support for retracement entries in an uptrend. Conversely, it can be used as resistance for retracement entries in a bigger downtrend. Finally, the Chikou Span is the close displaced 26 bars back, showing the current momentum. Based on these conditions, one may define a composite trend to be displayed as paintbars. A bullish/bearish trend will see at least one bullish/bearish condition and allow neutral states from other conditions. A composite trend reading with contradictory readings, i.e. both bullish and bearish conditions will be interpreted and display as neutral. DISCLAIMER: Futures, stocks, and spot currency trading have large potential rewards, but also large potential risk. You must be aware of the risks and be willing to accept them in order to invest in the futures, stocks, commodities and forex markets. Don't trade with money you can't afford to lose. This website is neither a solicitation nor an offer to Buy/Sell futures, stocks, commodities or forex. No representation is being made that any account will or is likely to achieve profits or losses similar to those discussed on this website. Past performance of indicators or methodology are not necessarily indicative of future results.